There are plenty of litter boxes to choose from and equally as many kinds and options for cat litter. Choosing one depends on your preference, and yours and your cat’s needs. The Purina Tidy Cats Breeze Litter System gives you an all-in-one solution, providing with you with a litter box, a scoop, cat litter, and urine pads for your beloved feline friend. If this is your first time to buy a litter box set or if you simply want to add a new one for your multi-cat home, Purina Tiny Cats’ litter system gives you everything you need to make your kitty comfortable and your home mess and odor-free. The kit features everything you need for your cat to relieve itself – it includes one litter box, the brand’s unique pellets for cat litter, a scoop, and 4 pads ( Read Review of Breeze Tidy Cat Litter Pads here) that absorb urine. The cat litter used in this kit are hard and firm pellets made of silica gel and zeolite. They’re harder than regular clay litter, and they feature a unique ability that prevents them from absorbing liquids, but rather, urine passes through them and straight to the pads placed on the tray and found at the bottom of the litter box. This feature makes this litter system stand out from every other similar product in the market. Instead of the pellets catching your cat’s urine and clumping up, urine passes through them instead, and goes straight to the pad that does the absorbing. Your cat’s feces, on the other hand, stays on top of the pellets where you can see them, making them easy to scoop out. Convenient – This set has everything you need to make your cat comfortable. You won’t have to buy a litter box, then buy the cat litter separately, and so on. It’s great for first time cat owners who may not know what to buy for their pet’s litter box. Little to No Odor – Because the pellets don’t absorb liquid, your home won’t have that awful strong urine ammonia odor typical of homes with pet cats. Easy to Clean – The pellets allow for your pet’s waste to sit on top of the litter, so you won’t have to sift or dig through the pellets. Clumping is also not a problem since the pellets don’t absorb moisture. Pellets are Reusable – Buying cat litter can be a burden so if you don’t want to go to a store each time you run out, the pellets can be washed and reused again. Little to No Tracking – Since the pellets are hard and firm, they won’t stick to your cat’s paws as much as clay does. Pellets Stick to Poo – Some customers have complained that the pellets stick to poo, and that they’re losing a lot of cat litter because of this. Buying Pads and Pellets only from Tidy Cats. The kit comes with a bag of pellets and 4 urine pads. One pad can last up to 1 week without giving out a scent of pee. Basically, the kit is good for one month’s use and if you want to maintain using the litter box, you’d have to buy your supply in advance and from Tidy Cats only. The litter system is great for any pet owner who wants to have their pet cat indoors or inside bedrooms. Since the pellets are hard and firm, tracking is a rare problem with the product, which makes it perfect for anyone using carpets and wooden tiles as flooring. The box has a maximum weight capacity of 10 lbs, so it’s meant for smaller cats. If your pet urinates a lot, this litter system is a great addition to your household. Tidy Cats Breeze Litter System is a simple, no-fuss, and truly effective product that makes your cat comfortable and your life convenient. An all-in-one solution, it features all the things you need to make a litter box, as well as an added feature not found in most litter box kits, which is the absorbent pad placed on a tray at the bottom of the box. The most important feature of this litter box kit is its successful separation of urine and waste. This features helps to eliminate odor (if interested read how to eliminate odor with Cat Litter Deodorizer – Here), since urine is no longer absorbed by the pellets. It’s not ideal for bigger cats and if your pet wants some privacy, there are no hood attachments available to buy for this box. 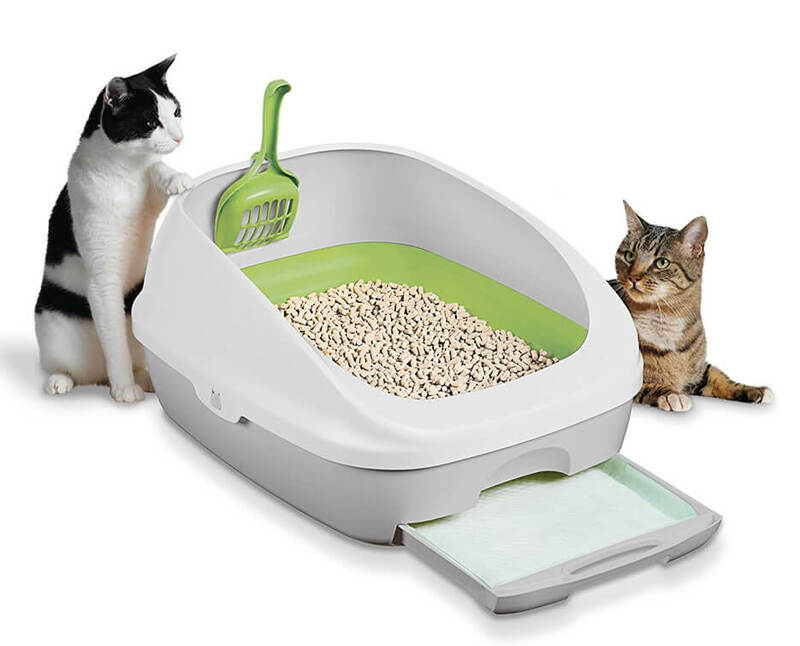 But for a basic and accessible litter box kit, this is definitely worth a try. For more info and more cat litter product Visit Home Page.